The conspicuous ‘Western’ iconography of some toy guns provides a clue to the intractability of America’s gun culture, which Joan Burbick suggests works to make ‘gun ownership moral, fun, and normative.’ A culture beset by entrenched rhetoric: destroying and exchanging toy guns, defending them as appropriate for children, considering video games as an evolutionary offshoot, distinguishing between water guns and other play armaments, foreigners aghast at the American fascination, or highlighting different attitudes between the US and other nations. A culture legislating toy guns since 1988, but paradoxically unable to stem the rising tide of actual gun ownership. I’ll not attempt here to advocate explicitly against toy guns; neither shall I be arguing for them. Nor will this be a causal claim linking toy guns and real violence. Instead, I seek to highlight the continuity between toy guns and the narrative strategies of America’s enduring popular genre, the Western. A genre nearly 200 years old that, despite its notable variations and evolution, continues to dispense ‘justice’ from the barrel of a gun. Amongst the brightly colored blasters, zappers, and squirt guns offered today, the ‘old West’ cap gun retains a residual appeal, as evidenced by the ‘Dodge City’ cap gun (left), currently available at the popular Cracker Barrel restaurant and general store. Who is this ‘Western’ marketing for? Like toy guns, Westerns are still a ‘thing,’ but their hold on US popular culture has diminished drastically since the 1960s. Most kids in 2018 have precious little in the way of narrative reference. 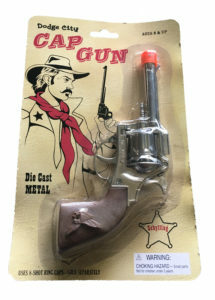 ‘Western’ toy guns appear, then, to appeal to an older audience, those who recall fondly the smell and feel of the toy guns of yesteryear. Historian Gary Cross notes that toy cap guns appeared as early as 1859. Safer elastic projectiles prompted early 20th century marketing tie-ins with popular media figures. 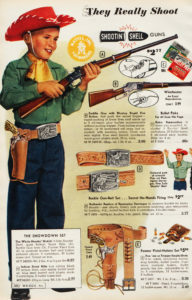 Given the saturation of Westerns, many toy guns were made to emulate Western heroes’ weapons. According to Edward Buscombe’s BFI Companion to the Western, from the 1920s to 1950s Westerns comprised ‘between a fifth and a quarter of all films made in Hollywood.’ Early radio and television continued the glut of Westerns, capitalizing on the successes of The Lone Ranger, Roy Rogers and Hopalong Cassidy. This saturation peaked in the 1958-9 season, when six of the top seven shows were Westerns. Verisimilitude was the goal when aligning toy guns and figures of the ‘old West.’ Below are three sliders juxtaposing cap guns with actual 19th century pistols or their live-fire replicas. The similarities aren’t just uncanny, they are exactly the point. By the late 1950’s Mattel’s ‘Fanner 50’ cap gun TV advertisement would boast of the ‘true stamp of the old West.’ ‘Western’ authenticity is also writ large in this full page ad for Mattel’s cap guns that ‘really shoot’ from a 1959 Wards catalogue (below). Mattel’s ‘Safe Shootin” shells are the precursor to popular foam dart and disk guns currently sold by Nerf. As Jesse McKinley and Matt Richtel, note, though, Nerf’s products mitigate the violence embodied in today’s toy guns, which are never actually called ‘guns.’ Instead, they are called ‘blasters’ with mollified names like ‘Infinus‘ or ‘Accustrike‘. The Western’s popularity fell precipitously from its 1959 peak, with subsequent decades producing so few titles that by 1992 Buscombe could refer to the genre as a ‘museum piece.’ Nevertheless, producers of subscription-based services continue to carry Westerns into the 21st century with shows like Deadwood and Justified garnering popular and critical acclaim and films like True Grit (2010) and Django Unchained (2015) receiving Oscar nods. Why the genre still exerts a hold on our imagination is perhaps fairly simple. As Jane Tompkins claims, ‘the genre exists to provide a justification for violence.’ An indispensable part of this fantasy, the pistol symbolizes the power of the single individual, of unambiguous conflict resolution achieved with a satisfying ‘Bang! Bang!’ confirming when, how, and for whom gun violence remains justifiable. Within this new normal, then, perhaps it should not be surprising to see a ‘Western’ style toy gun. Nor should it surprise us to see a Western film like 2017’s Hostiles open with a raid on a homestead that is also conspicuously presented as the invasion of a school house. Westerns have survived by adapting to more modern political sensibilities, yet retain a core formulaic worry over guns. Similarly, whilst toy guns have evolved significantly since the 19th century, they are still a ‘thing’ because they reify, embody, and encourage interaction with the core civic value rehearsed within the Western genre: the justification of gun violence. AUTHOR BIO: Justin A. Joyce is Research Associate to Provost McBride at Emory University and Managing Editor of James Baldwin Review. His new book, Gunslinging Justice: The American culture of gun violence in Westerns and the law, was recently published by Manchester University Press and is available to buy now. Category: Blog, Cinema, Film & Media, History, Law, Uncategorized	0 Comments.